When you ask a young girl anywhere in the world where she keeps her money, chances are she’ll say her piggy bank, school bag or in a special hiding place at home. And, as we discovered during our focus groups last December, young girls in and around Ahmedabad in the Gujarat state of India are even more likely to say they keep their money with their mothers. 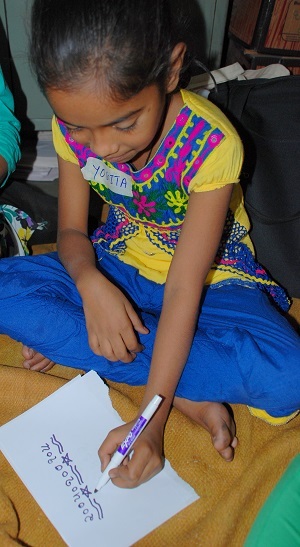 With the support of Credit Suisse, Women’s World Banking is working with its network member SEWA Bank to design a unique savings program targeted to girls. The project aims to help girls build assets in their own name and build their financial capability, beginning at a young age. We were in India conducting the customer research that underlies all our program development work in order to learn about the lives and needs of the target client, in this case, girls aged 10-17 whose mothers are clients of SEWA Bank. We wanted to understand how these girls interact with money—how much they receive, from whom, how they spend it, and where they keep it to develop a savings and financial education program that would best serve their needs. A common misperception is that youth from low-income households (as well as the adults) do not have any money to save. However, as Women’s World Banking’s customer research has shown time and time again, low-income youth, especially girls, do handle and save money—and one of the most fascinating things we learned about these girls’ financial lives was the complexity of this cash flow. Our key insight from our research was this: parents, especially mothers, feel responsible for fulfilling girls’ financial needs and guiding their daughters about money. The women in our focus groups told us that they wanted to protect the girls, help them make good decisions and ensure a successful future for them. Hence, they prefer to handle savings and expenses for their daughters, while allowing them to keep a bit of money to spend on their own. One consequence of this strategy, however, is that girls’ knowledge of money and finance is restricted to the little experience she is allowed to have and what her mother can teach her, which itself could be limited. We realized that in order to effectively empower girls with knowledge and access, SEWA Bank would need to include mothers in the process. True enough, when we asked the mothers about financial education sessions for their daughters, many expressed their interest in being part of the sessions so they can learn alongside their daughters. Based on what we learned from this customer research, we will be working with SEWA Bank on developing a savings and financial education program in which girls can learn and practice saving in their own names, with the support of their mothers, to help ensure a more financially secure future for themselves and their families.